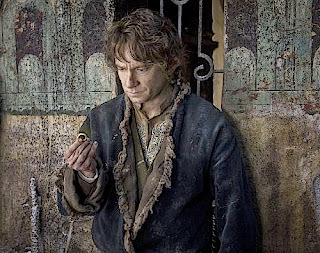 Martin Freeman and a certain ring-a-ding-ding in "The Hobbit: The Battle of the Five Armies." Dwarves, wood-elves, Lake-men, orcs, giants, eagles, battle-bats, wizards and wereworms show up for duty in spectacular fashion in "The Hobbit: The Battle of the Five Armies," the frantic final installment of director/cowriter Peter Jackson's three-film adaptation of author J.R.R. Tolkien's classic fantasy novel. Even if it's sometimes tough keeping all of the odd names straight and making sense of Middle-earth geopolitics, you don't have to be an Oxford don to appreciate sensational sword-slinging on this grand a scale. The previous film in the trilogy about a humble hobbit named Bilbo Baggins (Martin Freeman) accompanying a band of dwarves seeking to regain their mountain of gold ended with Smaug the fire-breathing dragon (voiced with sinister maliciousness by Benedict Cumberbatch) flying off to destroy the human village of Lake Town. That he nearly does, turning the place into a raging inferno before confronting the hunky and heroic Bard (Luke Evans). Bard leads survivors of that encounter to the mountain, hoping for promised help from dwarf king Thorin Oakenshield (Richard Armitage). Unfortunately, Thorin turns out to have undergone a rather nasty gold-fever personality change that's made him selfish, paranoid and hateful. An army of elves, led by the coldly imperious Elvenking Thranduil (Lee Pace) and seeking the return of their own stolen jewels that are part of the mountain stronghold, also are rebuffed by Thorin. Bilbo tries keeping the peace when the elves plan to join forces with the humans to fight the dwarves. Those negotiations are rudely interrupted by the arrival of well-armed dwarf reinforcements. When rampaging hordes of monstrous orcs also arrive on the scene seeking the treasure, all hell pretty much breaks loose for the rest of the movie. Ian McKellen returns as Gandalf, the wise and wizened wizard who has appeared in all six of Jackson's Tolkien films, but his main duties here are in a Sauron-'n'-Saruman-foreshadowing side plot that seems extraneous. This trilogy's main villain, the frighteningly nasty blade-armed orc known as Azog the Defiler (Manu Bennett), does not appear in Tolkien's novel, and neither do the huge and "Dune"-sandworm-resembling wereworms. Likewise, some characters from the "Lord of the Rings" trilogy who weren't in the book version of the "The Hobbit" make appearances here, most notably the coolly unflappable action-hero archer Legolas (Orlando Bloom). So do newly created characters that range from the acceptable (Evangeline Lilly's dwarf-loving elf Tauriel) to the agonizingly inappropriate (Ryan Gage's Russell-Brandish Alfrid, a cowardly opportunist whose appearances are supposed to serve as comic relief). As in the previous "Hobbit" installments, Freeman's Bilbo is in a near constant state of endearing bemusement as a simple homebody on a grand adventure in which he finds himself playing an almost reluctant hero. Although he again finds occasion to make use of a certain invisibility-granting ring, it's puzzling that the experience doesn't appear to have the same disturbing mental effects on him as before. The movie's spectacular special effects and elaborate cast-of-CGI-thousands action scenes are engrossingly satisfying, however. Seeing Legolas topple a tower to form a bridge over a chasm, and then use falling blocks from its crumbling wall as mid-air stepping stones, is classic adventure-serial stuff. Thorin's violent to-the-death struggle with Azog above and below a field of ice is similarly thrilling. Unless Tolkien's posthumously published "The Silmarillion" ever gets the big-screen treatment, "The Hobbit: The Battle of the Five Armies" is the last chance anyone will get to see Middle-earth. For the climactic battle scenes alone, it's worth the trip.